Juan Martinez holds three certifications, and has used these certifications to judge local high school and post-secondary culinary competitions, as well as being a mentor to young culinarians. He has held the position of Vice-President of the Chefs Association of Arizona for two terms in which he has helped organize monthly educational meetings as well as being an active member of the association. Chef Martinez has participated as a Certified Evaluator and Administrator for our Chapter throughout Arizona and New Mexico. While an instructor at Le Cordon Bleu of Scottsdale for almost 12 years; Chef Martinez received the schools Crystal Apple award four times as well as the Living the Vision Award in 2012. He was instrumental in forming a Junior ACF chapter at Le Cordon Bleu and mentored the leadership board in organization, planning and building a network to include other schools with similar interests in the culinary field. He also headed the Scholarship Fund Competition at Le Cordon Bleu. Chef Martinez believes there is a tremendous opportunity for growth potential through National Programs that are increasing in interest for our local chefs. These trends point to a successful commitment from chefs in our city in promoting awareness in “No Kid Hungry”, “Chefs Move to School”, “Healthful Kids Meals” and involvement with the “100 Club”, all of which he participates in. 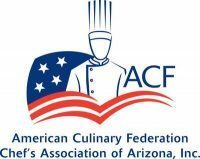 Chef Martinez has received the Chef Educator of the Year for the ACF Chapter AZ033 in 2013 and was the Chapter Semi-Finalist at the Regional Convention in Oakland California. He is currently a Board Member of our local ACF Chapter. As an AdjunctCulinary Arts Instructor at the Phoenix Art Institute he teaches Latin Cuisine, Classical European, World Cuisine, American Regional and Classical Fundamental Techniques. Chef Martinez is a dedicated culinarian with his best interest within the ACF, and has recruited over 20 Jr. ACF members and continues to mentor young culinarians in earning their Certified Culinarian certification at the completion of their schooling. He is currently mentoring students for competition and Army National Guardsmen for Certification training. Chef Martinez was the Chairman of the Volunteer Committee for the National Conference that will was held in Phoenix in July of 2016. He was inducted into the Chaines des Rotisseurs in December 2016 and currently serves as the Argentier for the Scottsdale Chapter. In addition He was inducted into the American Academy of Chefs in July 2016. Chef Martinez attended the Scottsdale Cuinary Institute, trained in Ottawa Canada and has traveled extensively throughout 50 countries all the while dedicated to the passion of Cuisine. In his last trip to Zambia Africa he was invited to Northrise University where he hosted culinary training and a banquet for campus visitors and staff. While in Africa Chef Martinez visited orphanages and participated in “Water Well” procurement for various regions. An exciting thrill was feeding 300 orphans a daily staple of “Nshima”white cornmeal porridge and dried river minows and watching the children with appreciative hearts and appetites.